The answer is yes. Today, most TMC systems deal with a constant on slot of complex operational decisions. We are faced with growing traffic demand that often results in concurrent incidents on a regular basis. We must also account for new requirements created for the protection of critical infrastructure. It is becoming more difficult for operators to rely solely on a SOP, even an automated one. In response, the functionality of TMC software systems is keeping up and now has the ability to consolidate information and automate their response to incidents, including automated messaging for updates to traveler information and social media feeds. Automation created big strides in efficiency for transportation networks, but now we have the specialized tools and the relevant data to go beyond ad hoc response. First, the use of rules-based expert systems allows for the system to select and recommend a response plans using a multi-variant approach that applies weights or scores to each rule, applies them to all candidate response plans and then calculates a total score to determine which plan best fits the event or incident. 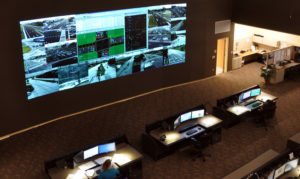 Second, tools such as traffic simulation models and decision support systems can quickly evaluate which of two or three possible response plans will have the best quantitative impact on traffic flow. Decision support for response plan selection, using both rules-based expert system and response plan simulation and comparison allows the TMC to optimize the response to both recurring and non-recurring situations that have negatively impacted transportation flows. When the TMC manager needs to make a decision about the best management alternative (e.g., divert traffic via Plan A; Plan B; or do nothing) he or she has access to quantitative results upon which to base their decision. In the modern city, with its multitude of interrelated systems, such as transportation, utilities (power, water, waste); public safety and security systems; building management, communications and information systems; no decision can be made in a vacuum – especially decisions about transportation management. The decision support system must factor in all of these variables into account and present the reliable quantitative results to the TMC manager (or the City Manager) for the final decision. I think you are on the right track. The paper you referenced is about optimizing power distribution through a network. This is not dissimilar to the distribution of vehicles through a roadway network, however there is one major difference. Power distribution must follow the laws of physics, while drivers behave like humans – that is, sometimes they behave irrationally and unpredictably. The reference to Pareto optimization principals may be valid. We are trying to affect transformational change in travel behavior rather than incremental. Assuming Pareto applies, if we can optimize and mitigate the worst 20% of the causes of traffic jams, we should be able positively impact 80% of the congestion.